Google play downloader is a simple application to Download Android apps install able apk files from google play to your computer. By downloading these apk files you can install it on your android phone without google play services and also distribute to other people. By using this it is possible to run an android system without a google play. Google play downloader will not allow you to download paid apps or paid games. This downloader only download free games and apps from google play. It is very useful to create a backup Android APK files on the computer. It is also helpfull if you don’t want to install some applications directly via Googe Play. There are lot of online services that provides the same functionality. From that sites you can directly download the apks. But this application is exclusive and you can directly download apks from google play. To download apks you needa Gmail Account and Android ID, you can create a Gmail account for this purpose. Generate a new Android ID with this applicaiton. If you change the email address in the Google Play Downloader settings, make sure you click the “Generate new Android ID” button (requires Java) or else downloading APKs won’t work. To install it on ubuntu just download the deb file and install it on the system manually. The deb only works on Ubuntu 14.04 and Ubuntu 14.10. For Ubuntu 14.10 users you need to download python-ndg-httpsclient and install it before trying to install the Google Play Downloader deb. 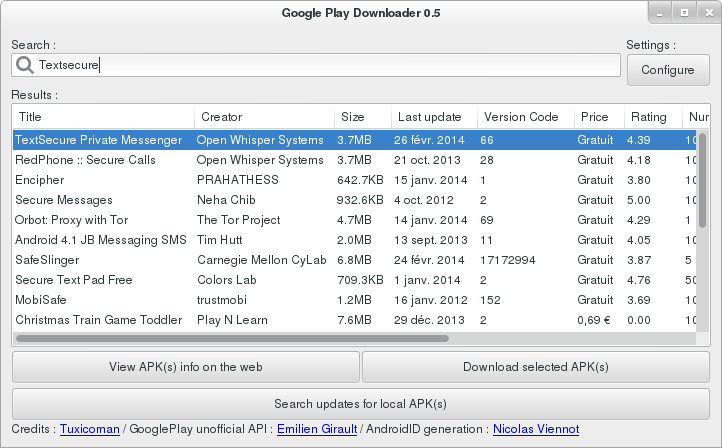 Arch Linux users can install Google Play Downloader via AUR. You can report the bugs , HERE. To start with downloading APK files directly from Google Play Store, visit apps.ezovi.com, there you will see a very simple interface to enter Package Name or Google Play URL to fetch the download link. You can also install a chrome extension to download apk files directly from Google Play Store. Microsoft want to Say Happy Birthday Linux.